We’ve just made it though the last weekend of July. It was this past weekend when mother nature decided to throw a curve ball delivering a cold and rainy weekend! It basically rained on and off Friday evening through Sunday morning and we were not excited about hanging out at the lake so we decided to stay home where it was warm and dry. Our son Nick mentioned on Facebook he and Bri hadn’t had plans and were looking for something to do. As soon as I saw his posting I sent a quick note “Wine Friday?”. Minutes later he concurred and we determined that they would come over for dinner and just hang out. Friday came, Chris and I were done working for the day. Bri was stuck in traffic and Nick was at the liquor store texting me about a couple of bottles of wine he was purchasing. One of the bottles was the Rodney Strong Pinot Noir. We have visited this winery in Sonoma many years ago, but had not tried their Pinot. I thought it was a good choice and had him pick it up. Bri and Nick arrived around 6:30 pm and after a few hugs and some small, talk Nick said he was ready for a glass of wine. We pulled the cork and had our first glass of wine of the night. At the same time I grabbed my tasting sheet and wrote down my notes. Shortly after our first glass, the bell door rang and we were greeted by a magazine peddler. She was pretty smooth and twenty minutes she left with a $230 check. We are sure hoping that the magazines actually arrive! The Pinot Noir was moderate and swirling helped a bit with the nose. It smelled fruity and seemed to be middle-aged. I noted red cherry and oak. My initial tastes of the wine felt dry and medium bodied and it was slightly tart. The tannins were week and soft. The Sonona coast Pinot was flavorful however. I could taste red cherry, bright red fruit. Nick thought we could taste roasted nuts and the finish was medium. How much: Nick paid $20 at the local liquor store. 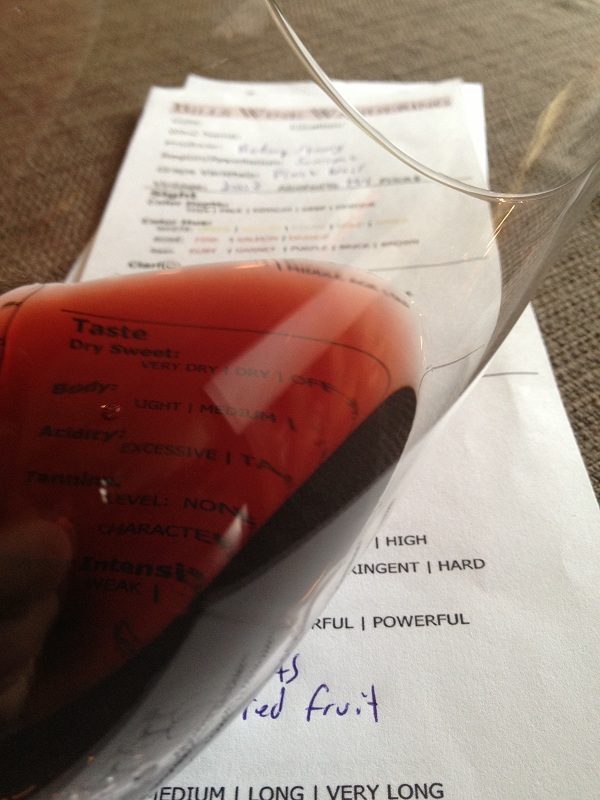 I rated the 2007 Rodney Strong Sonoma Coast Pinot Noir three glasses. I think Nick did a pretty job choosing his Pinot. I gave him a couple more pointers on choosing Pinot Noirs in a liquor store so we will see what he does next time. The night ended with a few bottles of wine. Bri had to work Saturday so she was the designated driver. We enjoyed our time with our grown-up “kids”. 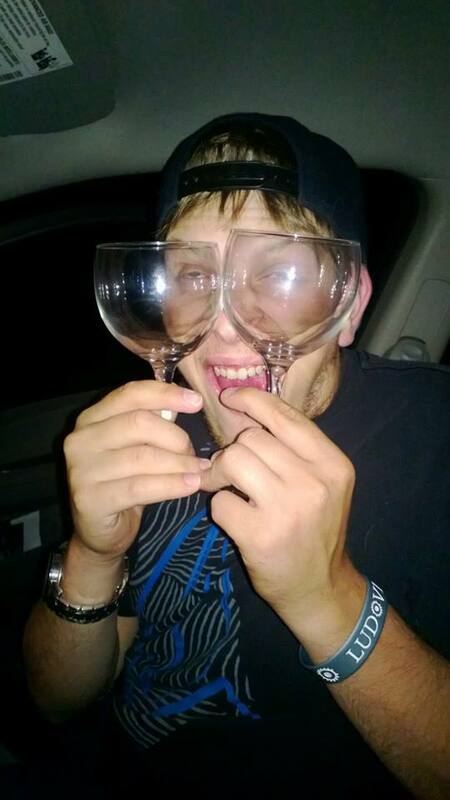 Prior to Nick and Bri leaving Chris brought Nick down and gave him a variety of wine glasses; some better quality and a few that wouldn’t matter if they were broken if used outside. On his way home Bri took this funny picture of Nick and posted in on Facebook. It brought us much humor and many “liked” the photo. I am thoroughly loving the fact my kids are becoming wine lovers like their Dad (and Mom)! It’s a lot of fun when they get silly as well!